After the long wait, I saw my name being announced as the second prize winner of NOEL AND LEVY’S THANKSGIVING CONTEST. Yiih! This is the very first time I join a contest and won at the same time. Cool eh? A big thanks to ate Levy for hosting this blog contest because I am able to brag now to my friends that I can win a contest. hehe. I wanna thank my facebook friends, relatives and my friend’s friends who like and comment on my post. 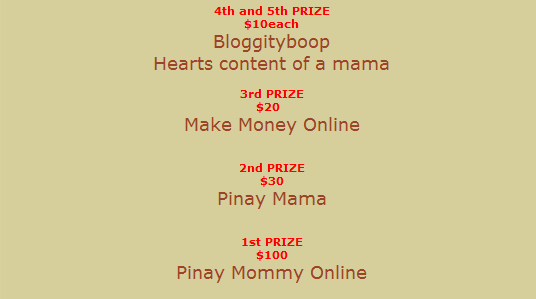 I am aiming for the first prize but I am contented for what I got because I know Pinay Mommy Online needs the cash more than I do. Hope it will help Bella’s surgery a lot. Godbless you all!